This book has been completely revised and updated for 2013. It includes more basic practice on telling the time. What is Perform with Time? Being confident about dealing with Time is one of the most useful maths based life skills. Perform with Time is a structured coaching book which covers all aspects of dealing with Time. It allows anyone to develop their ability to work with time, as Perform with Time is essentially about giving students the skills to deal with time in everyday situations. Perform with Time covers everything needed to be able to deal with time, works on the same highly structured and successful approach as our other books. A major part of its success is that it gradually builds up skills and knowledge, and it therefore has a huge impact on confidence and belief. Huge success of the Perform with Time is due to the immense sense of achievement that a person gets when working through the book. Based on the same highly structured approach of the other books. 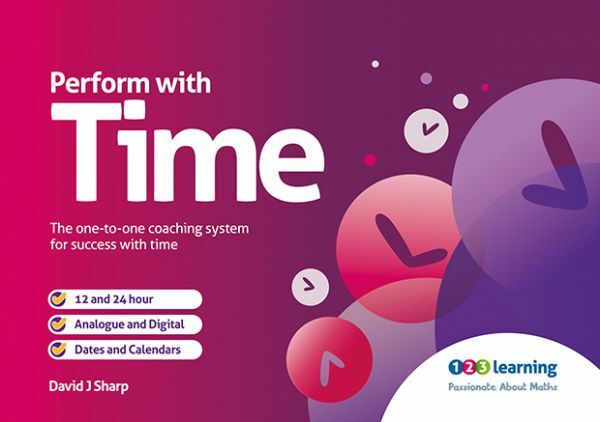 Perform with Time can be used as a standalone coaching book, or as a book to follow on from Power of 2, but has also been used successfully alongside Power of 2. It is suitable for all age groups from about the age of 8, right the way up to basic adult numeracy. The clear language and repetition benefits students with dyslexia and those with English as an Additional language. Students with dyscalculia benefit from the highly structured approach with clear explanations. . Perform with Time is a comprehensive teaching manual for Time which begins by teaching telling the time in many different formats. It looks at both 12 and 24 hour clocks, reading digital and analogue time, working out how long events last, and also includes a section on world time. Seconds, minutes, hours, days, weeks, months and years are also covered in detail. Full instructions and example pages are included in each book, but essentially The Power of Time requires that each question is answered correctly on three consecutive occasions on different days. When a question is answered correctly a tick should be placed on the line, a question answered incorrectly is marked with a dot. On each page of the book there is space for working out solutions, but students should be encouraged to carry out the calculations in this book without using pen and paper. It is not intended that certain pages should be used in isolation. Perform with Time has been found to work best when it is used 4 or 5 times a week, with each session lasting for about 10 to 15 minutes.